Self watering pots that wick water upwards from a water reservoir below have been around for decades. They’re commonly used for indoor plants, and they also have more specialized applications in the form of tiny wick watering pots used by African Violet growers. More recently, large DIY self-watering pots have been finding favour amongst tomato growers, and the latest self-watering trend to sweep the gardening world is that of wicking beds, self-watering pots scaled up to the size of a big raised garden bed. The system of irrigation used in self-watering pots and wicking beds, where watering is carried out from below the soil and wicks upwards is called sub-irrigation. In this article we’ll be looking at how to build a few different small scale sub-irrigation systems, from small self-watering pots to mini wicking beds. This system is used because it provides constant moisture and avoids the wet-dry cycle which is damaging to African violets. 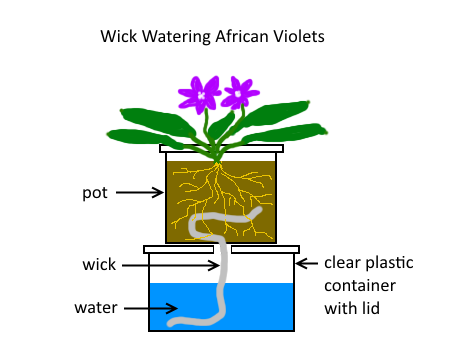 The design is very simple, and it only takes a few minutes to construct a water wicking African violet pot. (you can use a piece of cord approximately 15-20cm (6-8”) long made of synthetic material (natural materials will rot) such as acrylic or nylon with an open weave to conduct water). Soak the wick thoroughly in water so it is saturated, then thread it through a hole at the bottom of a plastic plant pot, and leave a reasonable length winding around inside the pot to distribute moisture evenly to the roots. Fill with potting medium and plant up with your moisture-loving plants such as an African violet. You will now have a planted pot with a ‘tail’. Water the plant well to evenly wet the potting medium and wick so it will all conduct water well by capillary action when you place the wick in the water reservoir. To construct the watering reservoir, take a clear plastic take-away food container, and make a hole in the lid. You can make a second hole in the lid near one side if you wish so you can refill the container with water without lifting the pot off to do so. Fill the reservoir with water, sit the pot on top of it, and make sure the wick touches the bottom of the water container so it can access all the water inside. With self-watering pots the wicking system can be made even more efficient than the simple cord wick, and the containers can be scaled up in size to accommodate much larger plants. In the next section we’ll look at the design used in commercial self-watering containers, and how we can adapt their design to construct our own DIY large-scale self-watering pots. Commercial self-watering pots and planters are available in a range of sizes from the smallest indoor plant pots to very large tubs and planters able to support large or numerous plants. These pots have a side opening or a tube where water is added to the reservoir, and they utilise a slotted barrier that separates the water from the potting medium. The barrier has hollow ‘feet’ that are also filled with the potting medium and these ‘feet’ sit in the water. 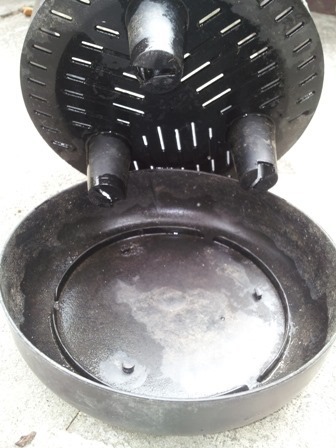 The clever part of the design is that the ‘feet’ have holes or slots in the sides allowing water in, so the wet potting medium extending down into the ‘feet’ acts as a wick and carries the moisture up into the rest of the potting medium as high as the potting medium material will allow. Self watering pot and its water reservoir, top view. Self watering pot and its water reservoir, showing how they fit together. Note the slots in the hollow ‘feet’ to allow water to wick up into the potting medium. There are also slots in the soil barrier (bottom of the pot) to allow water to drain into reservoir if watered from above. Now that we’ve seen how commercial self-watering pots work, we can design and build our own to suit our requirements! 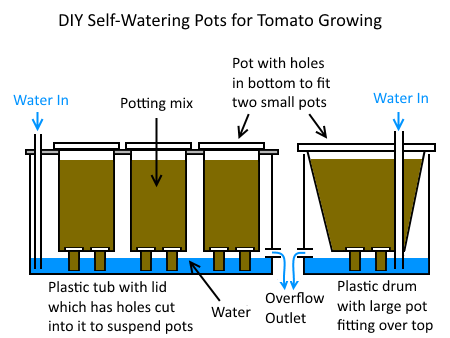 Very large DIY self watering pots can be constructed from large plastic tanks cut in half or plastic containers with lids, as shown in the diagram below. These function as small wicking beds that you can grow quite a few plants in, and they have the additional benefit in that they’re fairly easily movable. Additionally, they can be modified very easily to grow a wider range of plants than the self-watering pot that you buy off the shelf. If you’re into sustainable gardening, the great thing about these DIY self-watering pots is that you’ll make them mostly, if not completely, from recycled materials! The pots have holes cut into their bottom to fit two or more smaller pots that once again can fit into the holes (but can’t fall though!) It helps if these smaller pots have a lip to help hold them in place. These smaller pots act as the wicks and conduct water up into the pot. In place of these small pots you can also use the long, narrow mesh pots used in hydroponic systems. Make sure the lid is strong enough to hold the weight of the pots filled with potting mix and with plants in them. If required, you can use something under the post to hold them up, such as bricks or small pavers, or upturned terracotta pots. Plastic pots can be used but they need to be secured so they don’t move around. With the design on the right, a large container or plastic drum cut in half to hold water. A pot that is wider at the top than the water container fits in snugly to seal the system, and uses smaller wicking pots identical to the system discussed above. Both these designs have a water overflow outlet to prevent them flooding. You can simply cut or drill a hole on the side of the water container, or a make a hole and insert a small pipe if that’s more useful to direct the overflow water. Position the overflow outlet about 2.5cm (1”) below the tops of the small wicking pots, so the tops of the small wicking pots are always above the water. These DIY large self-watering systems are used successfully by tomato growers and can be used for growing quite a variety of vegetables. Experiment and see what works best! 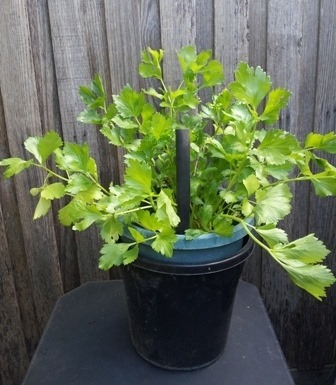 In case you’re wondering, the self-watering pot pictured at the beginning of the article growing celery is simply a plastic pot that fits snugly into a florist’s pot (what they use in florists shops to hold cut flowers, basically a pot without holes, or a bucket without a handle), with an offcut of 19mm polypipe irrigation tubing as a water inlet, and a single small pot underneath it all, which you can’t see, to wick the water upwards. You can also modify the design of these larger DIY self-watering pots to grow a wider range of plants such as those that require a much wetter soil. Some plants that can grow in very wet soil are aquatic marginal plants and bog plants. This includes a lot of edible aquatic plants such as water chestnuts, water celery, water parsley, watercress, water spinach (kangkong), duck potatoes (arrowhead) and many others. The modification is quite simple - if don’t put in an overflow hole it will flood and stay wet, but look like a regular plant in a pot without any standing water that will attract mosquitos. To make the design more flexible, you can put a tap in the overflow so you can use it with the tap open for plants with regular water requirements and with the tap closed so it floods for water and bog plants. If you’re into saving water, you can direct the water from the overflow pipe into garden beds, other pots, water filtration reed beds, wherever you like. The great thing about DIY projects is that you can get creative as you like! In this article we’ve covered the theory of sub-irrigation, and looked at how to build a few small to medium-sized sub-irrigation systems that are cheap, quick and easy to build. These projects are a great way to start experimenting with sub-irrigation without investing too much money, time and effort. If you’ve tried these and want to try something much bigger, then please have a look at our article on how to design and construction of full-size wicking beds.